Echo and I were mesmerized! 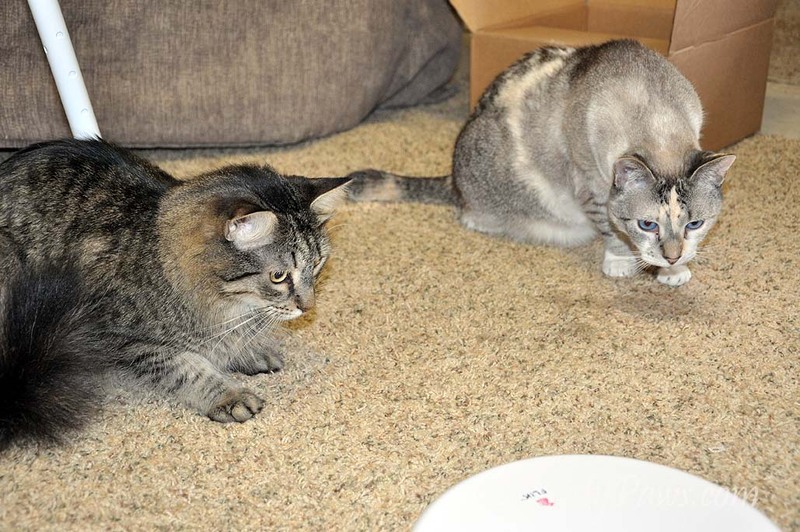 We were too busy watching the string to notice Ocean slinking out of the room. Imagine, the toy hog afraid of the new toy! 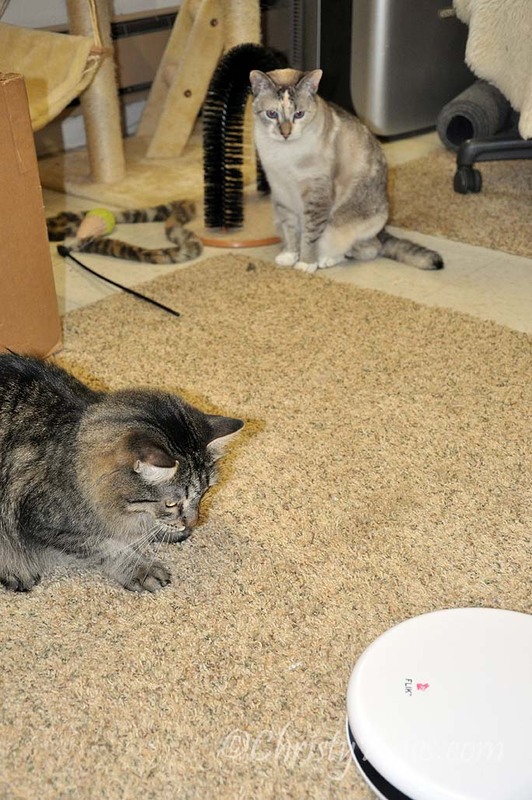 Echo was first to pounce and eventually capture the string. He pounced over and over. I watched and finally gained the confidence to try it too! Echo was very good about sharing and letting me have my turns. Suddenly, it quit working. What happened? We sat and sat and sat, waiting for it to do something. Mom came and flicked the switch again and we were on the hunt once more. We probably would have played until the batteries ran down if mom had kept turning it on! 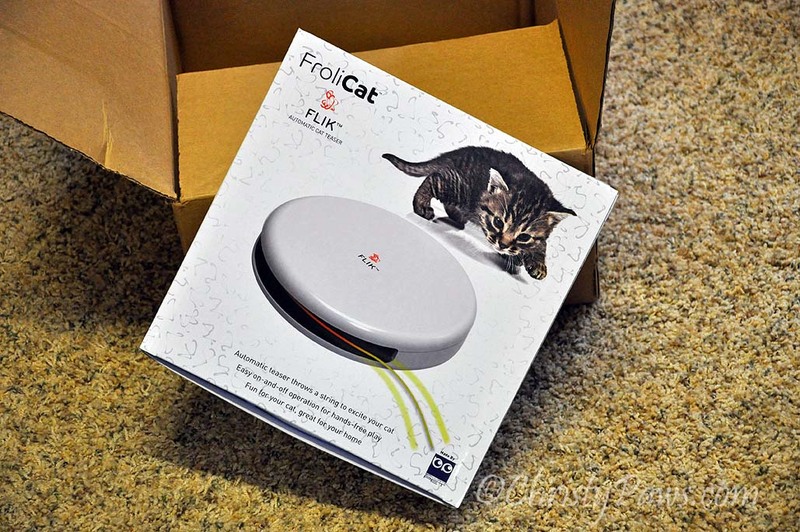 This was the FroliCat Flik we had won from Dezi and Lexi at Dezizworld. Dezi assured us we would love it and we sure do. Mom knew Echo would like it because he LOVES strings, but she was surprised at how much I like it. She was even more surprised that Ocean is afraid of it! Thanks, Dezi and Lexi, for this great prize in your giveaway. 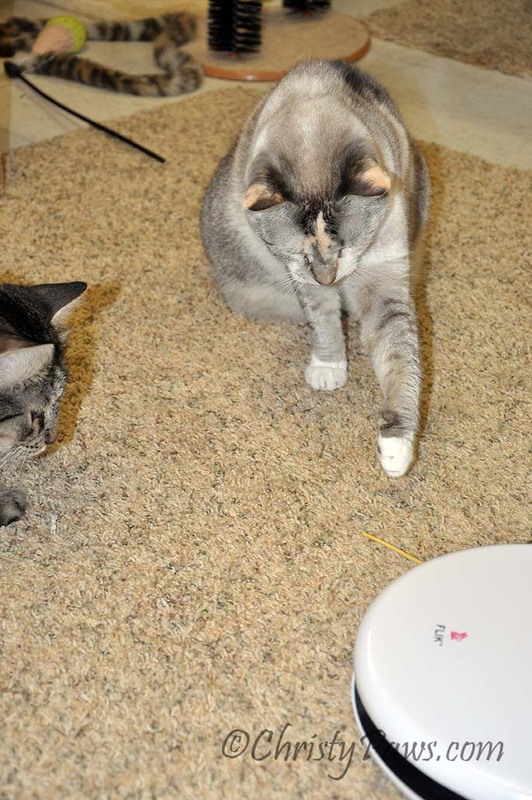 Tagged cat, cat photos, cat toys, Christy, Echo, FroliCat Flik. Bookmark the permalink. 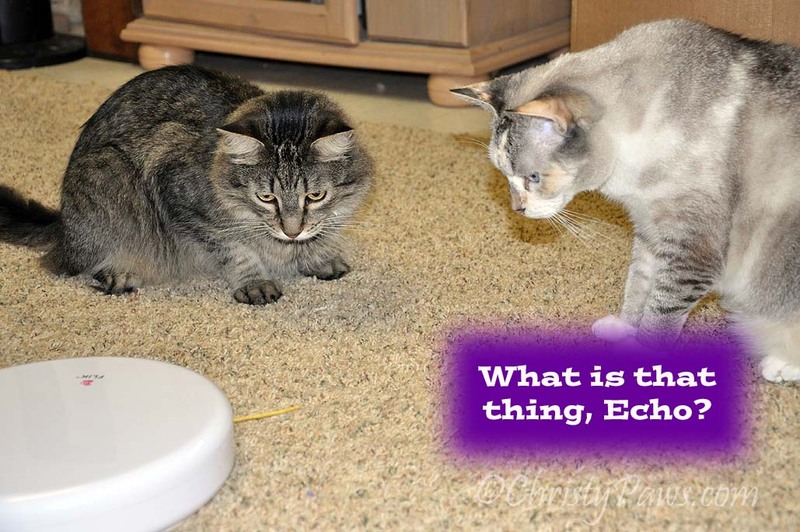 22 Responses to What IS that thing? That looks like a pawsome toy!!! Well dun Ocean an Echo!!! 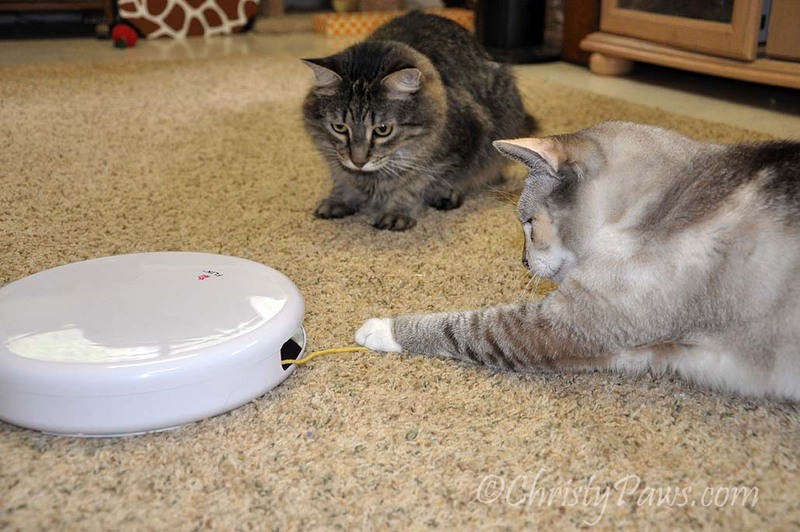 Christy maybe sum day you will like it…..mee isss hessytant ’bout toys with batteries also! OMC Weez so glad y’all like it. We luv it to pieces. Let me tell ya’ da on button be on da side, and very easy to push. Ifin yous wrap yous awrms wound it yous can turn it on yous selff. 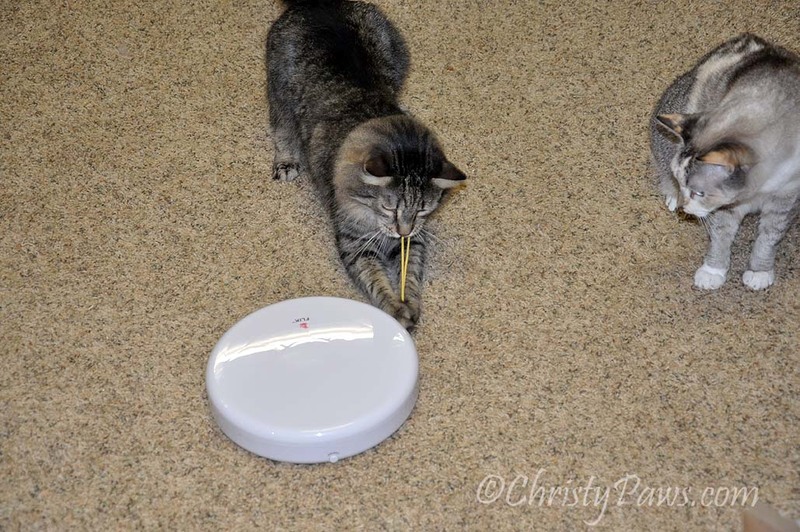 MOL Mommy luvs dat it can keep me busy and playin’, and sis Lexi too. Sowry not everypawdy had a good time. We know yous mommy be pickin’ it up when she’s not wound, but ifin she kuld leave it off and by Ocean, maybe hims wuld warm up to it. We was a little fwaid da furst time we had a toy like this, but mommy left it off and e finally got used to it and now we luv anyfin’ like this. Have fun. That sure looks like a fun toy. Congrats on winning that. 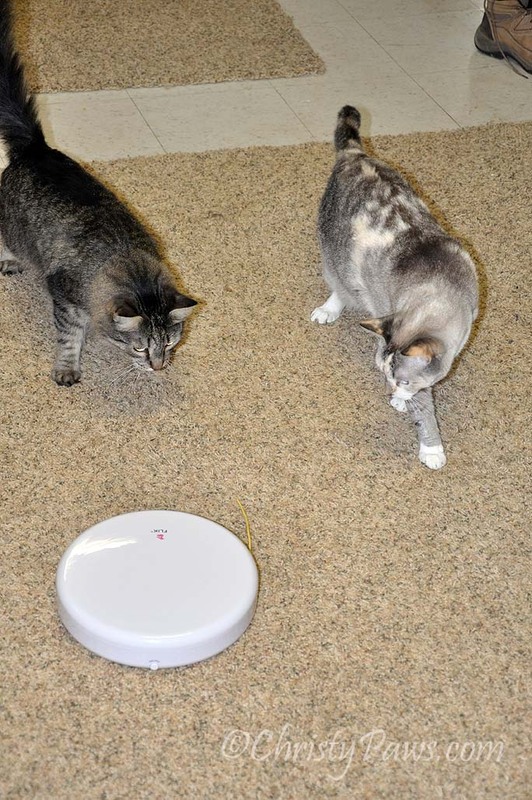 You kitties are going to have many hours of fun with that. Have a great day. wow, that sounds like a really fun toy! ConCATulations! That looks like a SUPER fun toy! That toy seems so much fun. 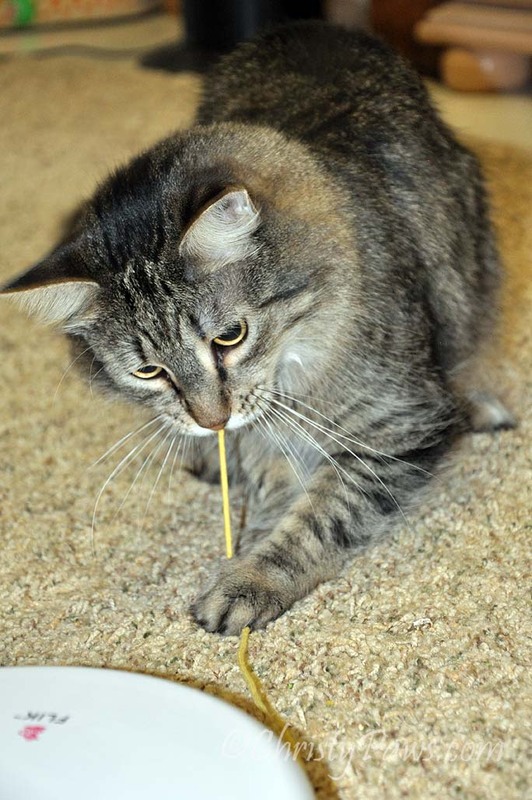 Mister Cat loves strings, so I’m sure he would love that toy too. Congratulations on winning the giveaway! OH FUN!!!!!!!!!!!!!!!!!!!!!! Looks like it was a BIG HIT! That looks like a super fun toy! I know Carmine would love that, but Milita would be scared of it, too. Maybe Ocean will check it out after it’s been around for a while and sees how much fun you are having with it. that’s one of Cody’s favorites and it was one he had that all of his friends could enter to win in his birthday give-away last April. Be careful with the string though. 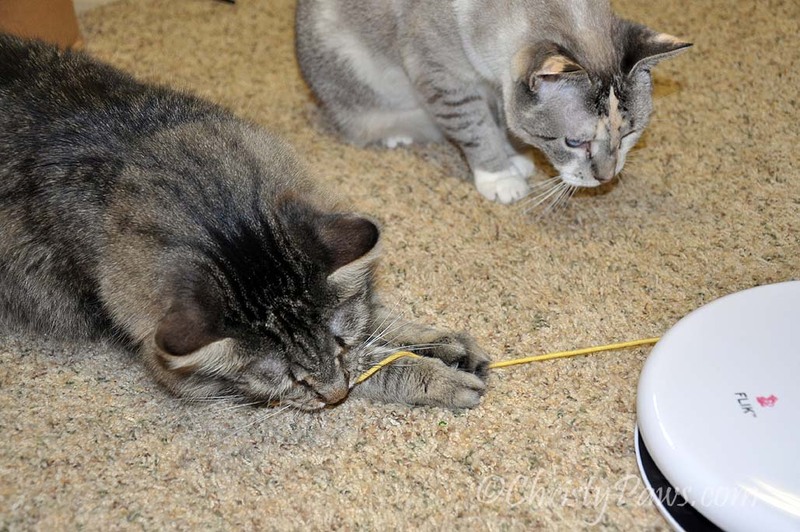 Cody loves string and I have to watch him like a hawk with that toy because I am afraid he will chew through it. Mom worries about that with Echo so she puts it away when she’s not watching. MOL Looks like a hoot and a half Christie! You lucky devil. You will be fascinated with this toym I can tell. That sure looks like a lot of irresistible fun! It is going to give you hours and hours of entertainment. That looks like lots of fun! I want one now too! Congratulations on winning a great prize. Looks like you are having fun. Wow, that sure looks like fun! What a pawesome toy! Concatulations!